Did you know that these mini bags are not pictured in the catalogue but they are still available for sale? They are the perfect size for the little conversation hearts which I just think are so cute. Of course I had to eat the ones that you couldn't read clearly. Your welcome. It wasn't easy but it had to be done. Then you can use scrap cardstock like I did to punch out a couple of hearts and emboss them with irridescent ice embossing powder. The stamp set I used was P.S. I love you from the current mini catalogue. Want to hear something mushy? I showed it to Irv and "star eyes" is what he says he has for me. Of course, "Je t'aime" is the candy heart from me to him. 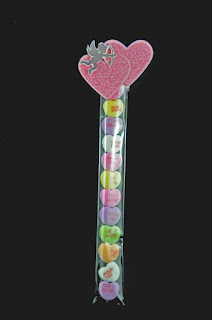 Now, which candy heart would you give your sweetheart? What a great Valentine gift! Love it Denise!! Your blog looks great! I love your style of writing, it is very cute! Just like you!